post-title History in The Hill. Home / 2017 / History in The Hill. The Hill at Number 1 Old Mountpleasant in Ranelagh has gone through several owners and names over the years it has been in business. It’s an iconic building in Ranealgh, especially because of their stand-out sign at the top of the pub. 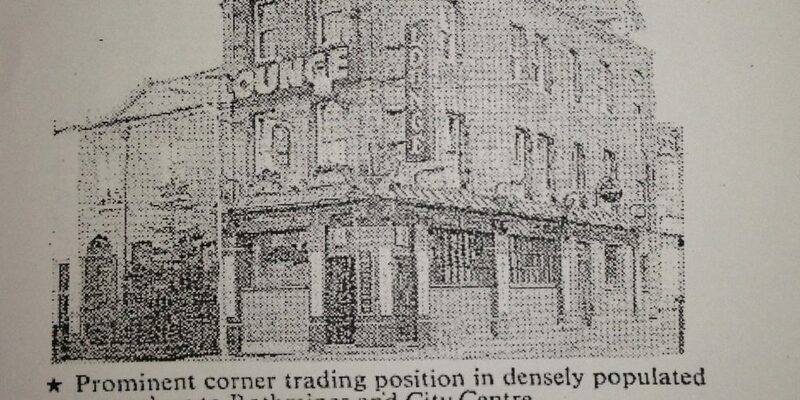 We took a look through the Irish Newspaper Archive to see what we could find about the history of the pub. We found a few snippets that tell some of the story of the ownership of the pub from 1912 to the present day. 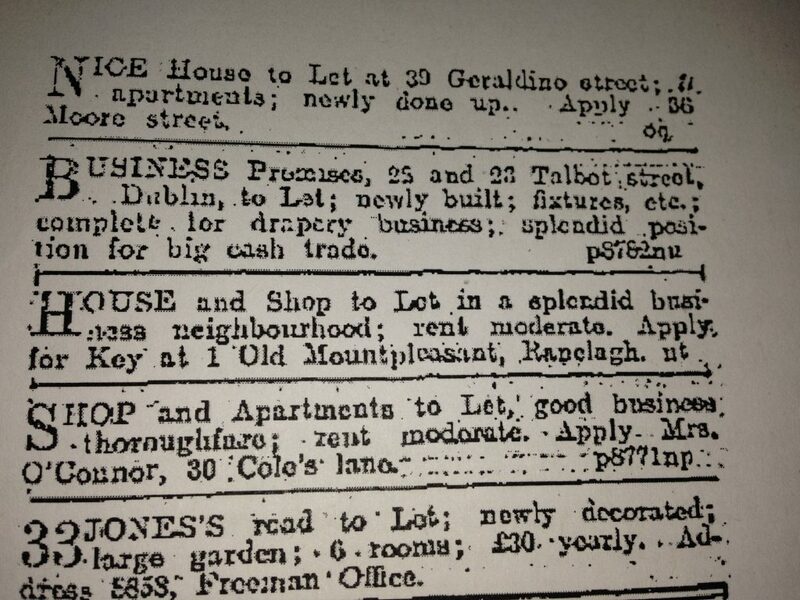 There is a mention of the pub by address only in this advertisement for a house and shop to let ‘in a splendid business neighbourhood’. The fact that applications had to be made to 1 Old Mountpleasant might indicate that the owner of the pub at that time had other properties. We learn that in 1938 that the pub was put up for sale and was at that time known as ‘Butler’s’. 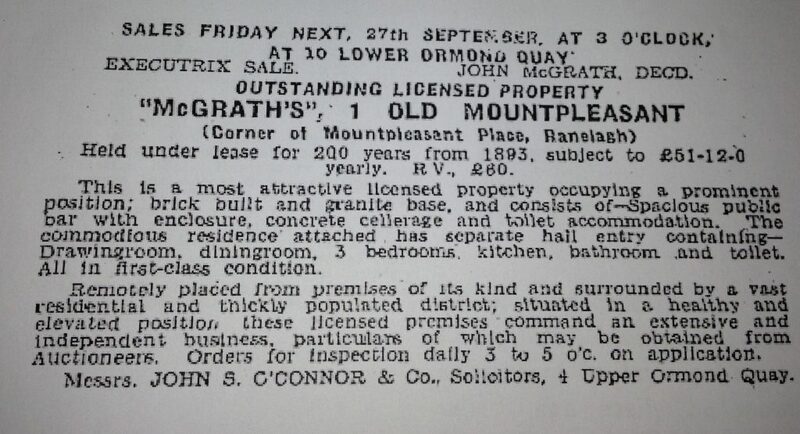 In 1957 the pub was known as ‘McGrath’s’. 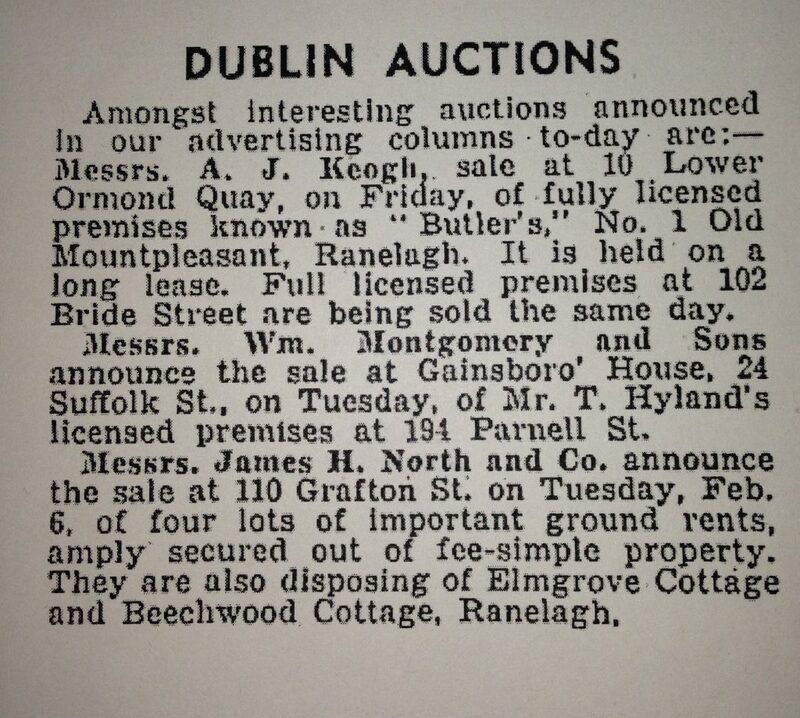 We can assume that McGrath bought the pub from Butler in 1937, as there are no other notices of sale in the period between these dates. There is a not very detailed description of the pub and a mention that the pub is in a ‘healthy elevated position’. This would likely be significant because cellars would be prone to flooding at the time. 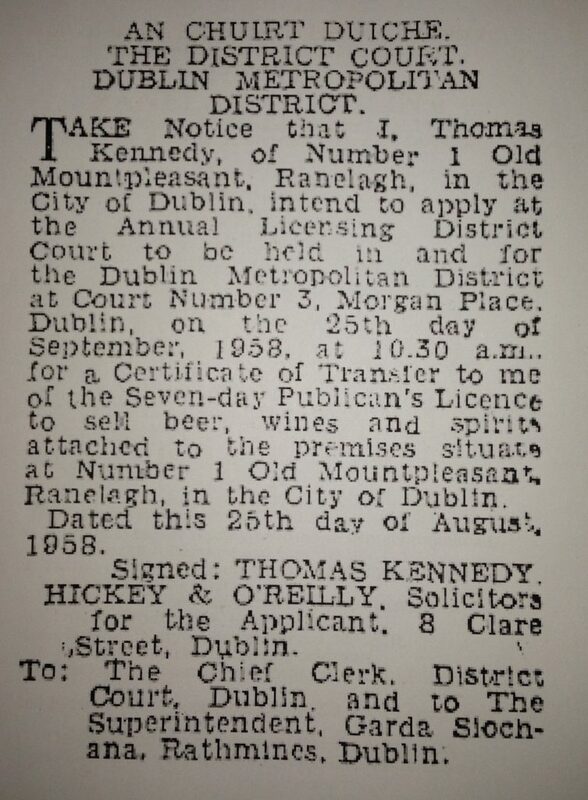 Thomas Kennedy bought the pub following the auction the previous year and notified the public of his intent to have the license on the pub changed over to his name. We seem to remember that there might be some mention of Mr. Kennedy in some of the fixtures above the bar. 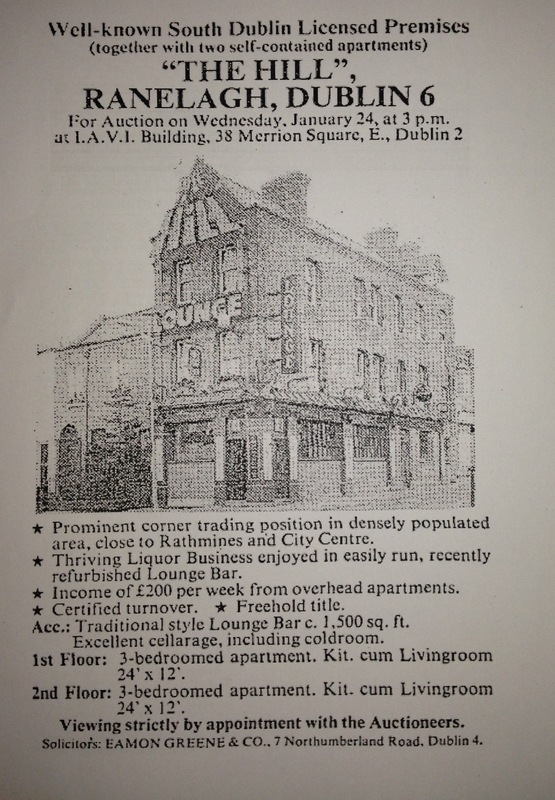 This advertisement for sale from 1990 features a photo and shows us how little has changed of the exterior of the pub since then. They make mention of the income that the property also derived from renting apartments above the pub. All of that has piqued our interest in researchnig the pub a bit more. We’ll have to make a return to the archives and see if we can paint a clearer picture. These days The Hill is well known for having very good food, their gin festivals, and a great selection of local and international beer.